For more information on all the procedures & skincare we offer, visit our website www.claudiamcgloinclinic.com or call 0719140728. Campbell de Morgan also known as cherry angiomas or blood spots are benign skin growths made up of blood vessels. They are bright red and can appear anywhere on the body, but are mostly found on the torso. They range in size from a pinhead to a quarter inch in diameter but are painless. What Causes Campbell de Morgan Spots? Nobody knows for sure what causes them but they may be hereditary and related to hormonal changes. They can affect both men and women and can form in late 30's/40's. How Are Campbell de Morgan Spots Diagnosed? A medical professional will usually make a diagnosis just by looking at the spots. While cherry angiomas are non-cancerous, it’s important to make sure you’re not dealing with something more serious. I would recommend having a medical professional check them out if you have red spots or angiomas that bleed, that are painful or itch a lot, or that seem to be changing in colour and shape. How Are Campbell de Morgan Angiomas Treated? In many cases, no treatment is necessary. However, sometimes the angiomas bleed frequently, or can they stick out from the skin and may catch on clothing that can cause injury and bleeding. If people are concerned about how the spots affect their appearance, especially if there are several of them and if they occur in a highly visible place, like on the face they may want to have them treated. Cherry angiomas are usually removed via some sort of minor surgical procedure, such as excision (shaving off the spot), electrocautery (burning off the spot) or cryosurgery (freezing off the spot with liquid nitrogen). Sometimes laser therapy is used instead to remove these spots. Removing multiple angiomas may take longer and cause more discomfort than just removing a single angioma. Your medical practitioner will assess and discuss their recommended procedure best suited for you based on the location and number of spots you have, as well as any other medical concerns you may have. The Claudia McGloin Clinic need your help! We would be extremely grateful if you could take the time to vote for us for Best Aesthetic Clinic in The Irish Aesthetics & Beauty Awards 2017. 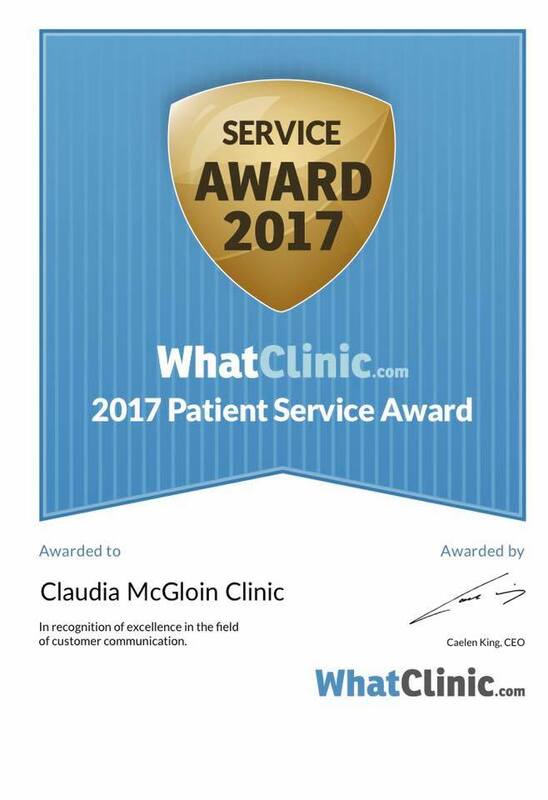 The Claudia McGloin Clinic are delighted to be included in the RSVP Wedding Awards 2017 in the Best for Beauty in Ireland category. 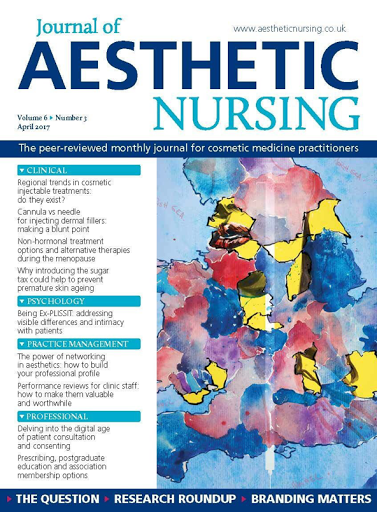 Claudia McGloin was quoted in July/August 2017 edition of Aesthetic Medicine Journal. The piece entitled Blood Works focused on Platelet Rich Plasma kits and procedures. 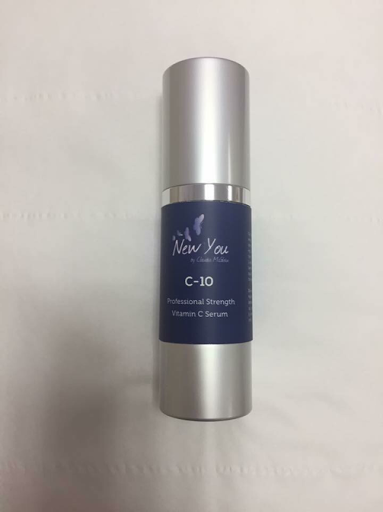 Claudia was quoted for using Dracula Therapy alongside Dr Daniel Sister. 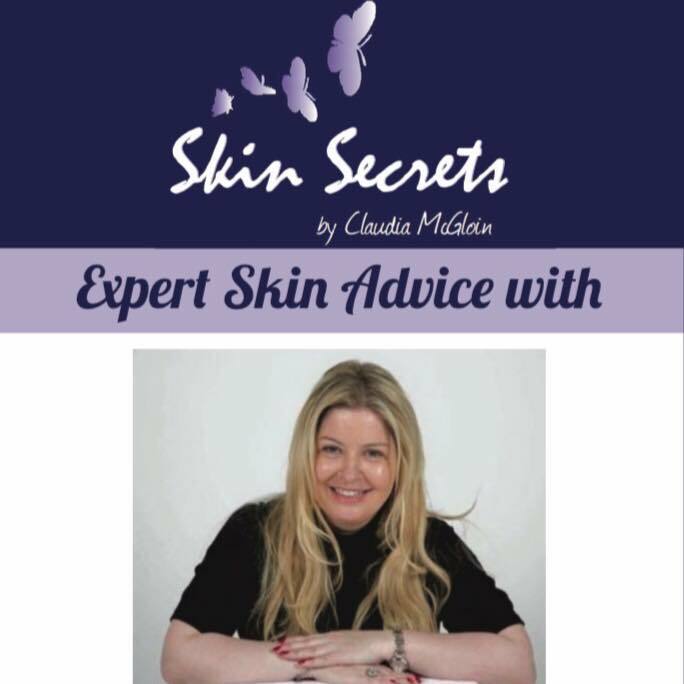 The Claudia McGloin Clinic is open Tuesday to Friday from 10am to 5pm. Late evening appointments are available subject to availability. 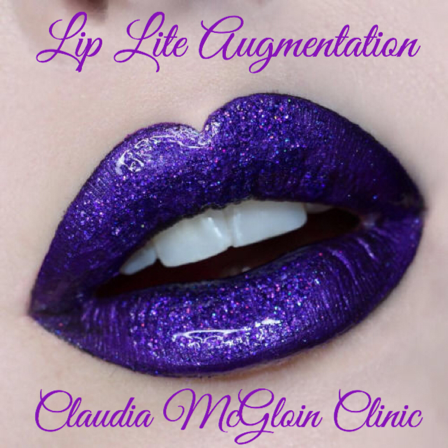 For more information on the clinic visit www.claudiamcgloinclinic.com or call the clinic direct on 071 9140728. Join me on the Live Stage at Professional Beauty Ireland where I will be discussing Skin Peels and introducing Advanced Facials to your treatment menu! 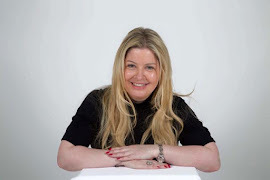 Claudia McGloin was recently interviewed by Claire Ronan for Up and Running on Ocean FM. 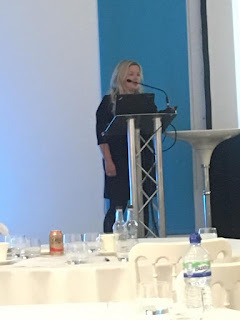 The Claudia McGloin Clinic were delighted to be invited to the Teolabs Training Day in Dublin recently. While catching up with some colleagues it was lovely to see demonstrations and hear lectures from some of the UKs finest. Thank you to Teoxane for the invite and we look forward to the next one. Keratosis pilaris is a common condition where the skin is rough and bumpy. It looks as if the skin is covered in permanent goose pimples. Keratosis pilaris most commonly affects the back of the upper arms, and sometimes the buttocks and the front of the thighs. Less often, the forearms and upper back may be affected. The patches of affected skin will be covered in tiny spiky bumps, which may be white, red or skin-coloured. This spotting looks like "chicken skin" and the skin feels rough, like sandpaper. In some people, the skin itches and there may be inflammation and pinkness around the bumps. The skin tends to improve in summer and get worse during winter months or dry conditions. Keratosis pilaris is very common, affecting up to one in three people. It can affect people of all ages but typically starts during childhood, although it can sometimes occur in babies, and gets worse in adolescence, around puberty. Keratosis pilaris sometimes improves after puberty, and may even disappear in adulthood, although many adults still have the condition in their 40s and 50s. Keratosis pilaris is hereditary and occurs when too much keratin builds up in the skin's hair follicles. Keratin is a protein found in the tough outer layer of skin, which causes the surface of the skin to thicken, hence the name "keratosis". The excess keratin blocks the hair follicles with plugs of hard, rough skin. The tiny plugs widen the pores, giving the skin a spotty appearance. It's often associated with other dry skin conditions, such as eczema. 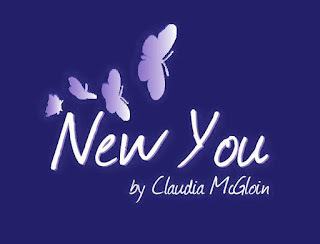 For more information contact the Claudia McGloin Clinic on 0719140728. The topic is Keratosis Pilaris which affects 1 in 3 people. 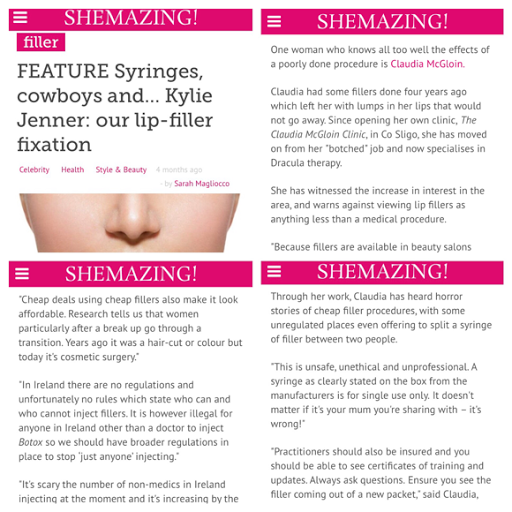 For more information please contact the Claudia McGloin Clinic on 071 9140728. Skin tags are soft, small skin-coloured benign growths on the skin that develop in both men and women. Skin tags, medically known as acrochordons, are usually a few millimetres in size but some can grow as big as 5cm. They are commonly found on the neck, under the arms, around the groin or under the breasts. They can also grow on the eyelids or under the folds of the buttocks. Anyone can develop skin tags and some people are prone to developing them for no apparent reason. It is thought that skin tags grow where skin rubs against skin or clothing. Skin tags are harmless and don't usually cause pain or discomfort but people may consider having skin tags removed if they're affecting their self-esteem, or if they catch on clothing or jewellery and bleed. Skin tags can fall off on their own if the tissue has twisted and has died from a lack of blood supply but it is not recommended to try to remove these yourself! Skin tags can resemble a wart. Here's how to tell if you've a skin tag. If you have a skin tag that's causing problems, speak with a skin specialist. Skin tags can easily be burnt or frozen off in a similar way to how warts are removed. They can also be surgically removed and removed using diathermy. For more details on Skin Tags and removal contact the Claudia McGloin Clinic. 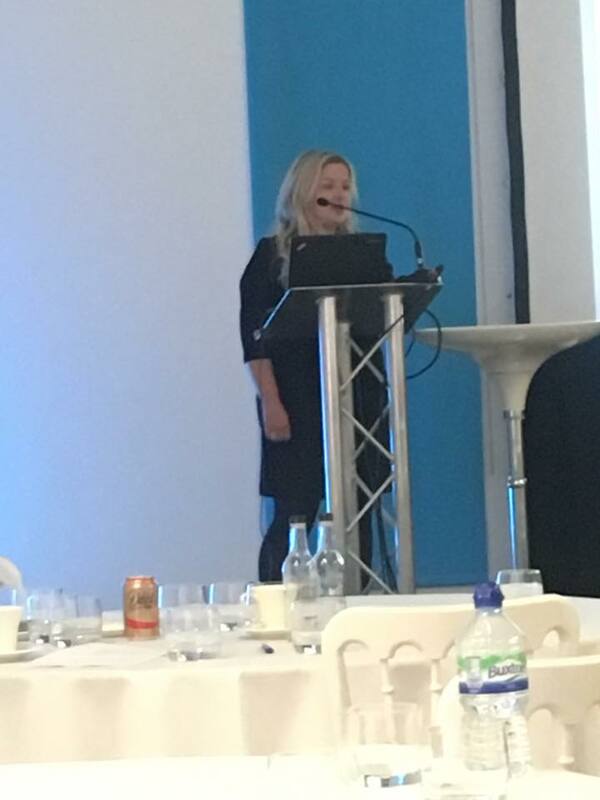 Last week we were in London for the annual Facial Aesthetic Conference and Exhibition (FACE). We were with Aesthetic Source on Stand for the launch of Clinisept - a game changer for the Aesthetic industry. We had an absolutely amazing couple of days on the stand and we met some lovely medical professionals from around the world. We also had a fantastic time at the annual FACE Social 2017 with our colleagues and friends. We would be grateful if you could vote for us for Best Cosmetic Clinic at The Irish Hair & Beauty Awards 2017. 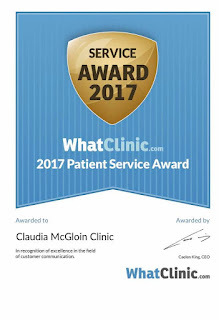 The Claudia McGloin Clinic were absolutely delighted to have been a finalist for Best use of Twitter for an SME at the Social Media Awards 2017. We were honoured and humbled to be listed among the Top 10 businesses in Ireland - a huge achievement in itself as there are so many amazing businesses out there! Sadly, we didn't win but there's always next year at the Sockies18! On top of being a finalist, Claudia McGloin was a judge at the Sockies17. We are looking forward to the Social Media Awards 2018 and fingers crossed will pick up a Sockie! Eating too much sugar over time ages the skin, making it dull and more prone to wrinkles. This is due to a process called glycation. Eat chocolate in moderation & cut out sugars where you can e.g. In teas/coffees and on breakfast cereals. Safety is paramount so, please only choose reputable experienced medical professionals in clinics. Non health professionals cannot deal with complications such as Vascular Occlusions! THREAD VEINS otherwise known as Spider Veins, Broken Veins, Venous Flares, Broken Capillaries or Surface Veins are extremely common. Telangiectasia, the medical term are red or purple in colour and are visible on the skins surface. They can appear in clusters or as individual veins and are usually about 1-2mm. They are also Genetic and effect both men and women. Facial Thread Veins are usually found around the nose but can spread up onto the cheeks. These are very different to the Thread Veins that are found on the legs. Although they are called Thread Veins they are Dilated Capillary Networks from your Arteries (Arteries take blood from the heart to the rest of the body and Veins return blood to the heart). The blood inside them is more oxygenated and therefore appear brighter red in colour. Facial skin tends to be much more sensitive than the skin on the legs, and is also exposed to daily elements like sun and wind. 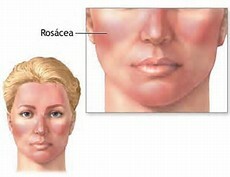 Facial Thread Veins can also be triggered by extremes of temperatures and are often a consequence of Rosacea. All of these treatments work by using heat to destroy the Blood Vessel. Injecting vessels on the face is NOT recommended! Thread Veins are generally harmless, but can, on rare occasions, be a symptom of other vascular issues. If you do happen to notice any thread veins, it's advisable to contact a medical professional with experience in skin conditions. 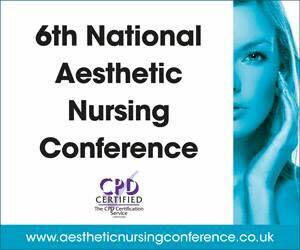 I'm absolutely delighted and honoured to be shortlisted for Aesthetic Nurse of the Year 2017. Truly humbled to among an amazing category with 7 other nurses. Last year I was awarded Highly Commended Nurse of the Year 2016 and am the only Irish Aesthetic Nurse Practitioner to be shortlisted for this prestigious award. 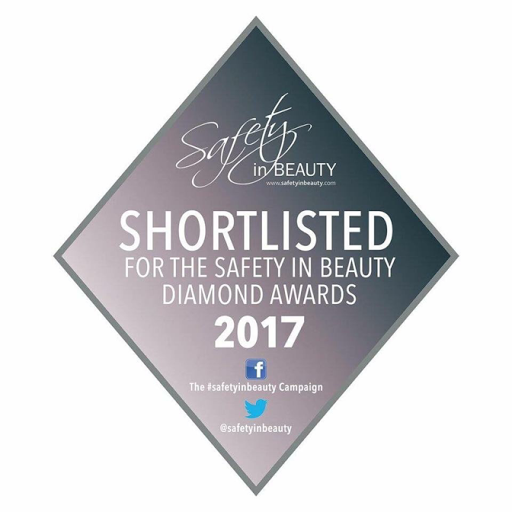 The Safety in Beauty Diamond Awards take place in The Langham Hotel, London in July at The White Party. Cannot wait to fly the flag again for Ireland and hopefully win the title this year. 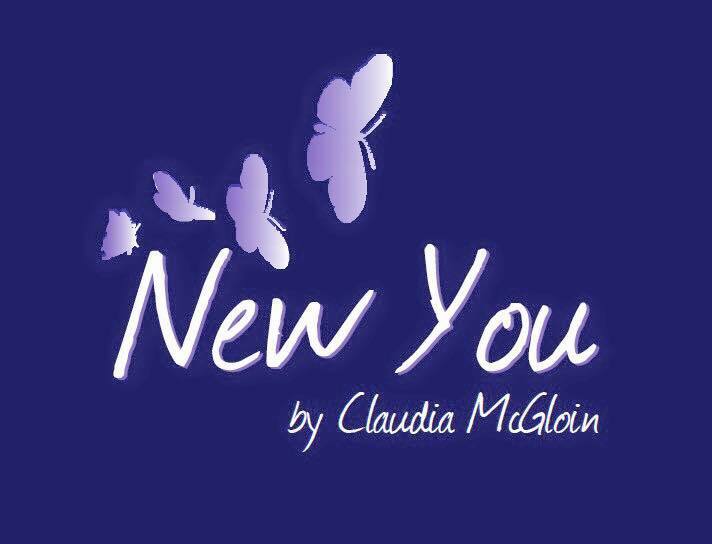 The Claudia McGloin Clinic are delighted to announce that we have secured a registered trademark for NEW YOU by Claudia McGloin® signature skincare.